Three of our regular contributors have all alerted us to the fact that the TransPeak double decker has returned to service in green TransPeak livery – Phil G sent a message confirming that it was out in service and that he looked forward to seeing a picture of it in due course. 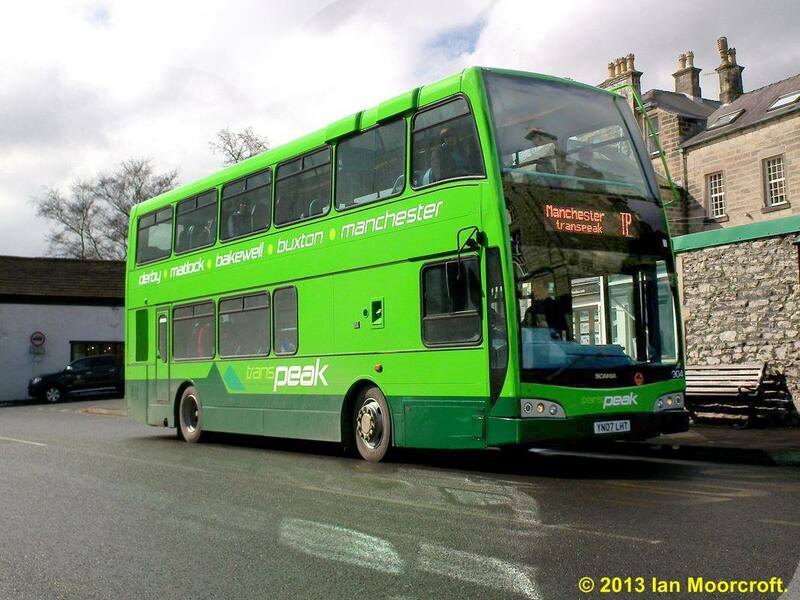 Ian Moorcroft sent us the first two pictures below and Tony Wilson has added to the posting by submitting a picture of the vehicle in the new livery as well providing some background information and pictures of the vehicle in service last year. Thanks to everyone for their contributions. 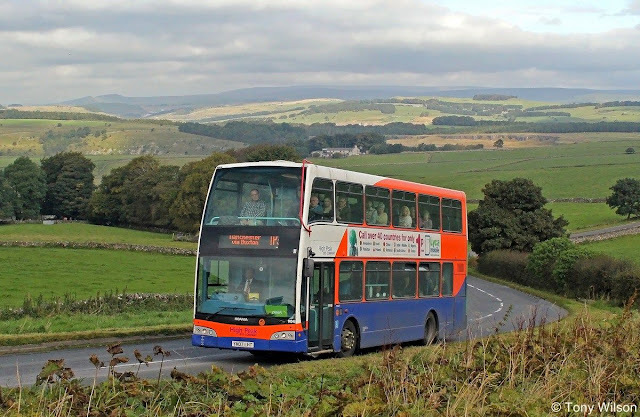 Tony Wilson reports:- The Scania decker used last season by the High Peak Bus Company on the Transpeak (TP) service, has returned from hibernation. 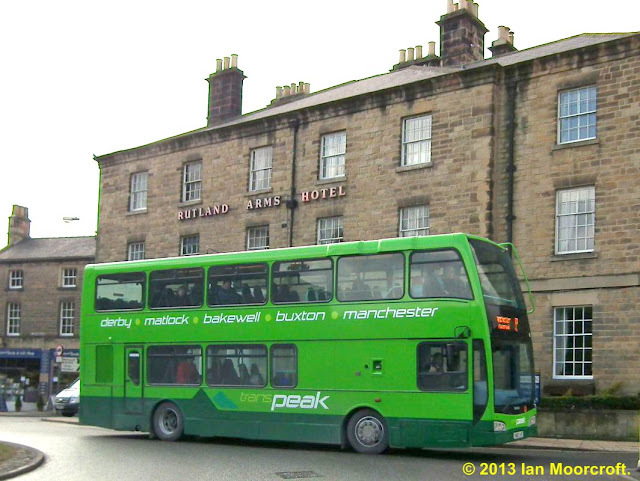 Whilst away it did receive something of a makeover as shown, and thus will obviously be a permanent feature on the route between Derby and Manchester during the year. And jolly fine it looks too along with bold route branding between the decks. 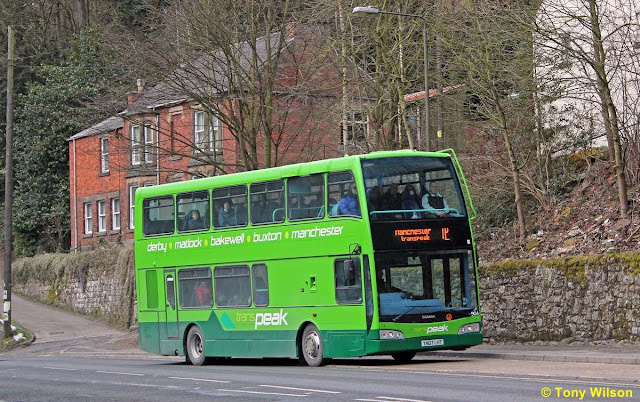 Captured here at the stop opposite Sir Richard Arkwright's Masson Mill near Matlock Bath yesterday, I wonder what he would have made of this mechanical beastie. I reckon he would have approved, especially the aesthetically pleasing livery for the area and probably Industrious and Revolutionary!. Shame it's a bit grubby, it's like that everywhere at the moment, but it does portray a sort of weather-related image. Two images shown below are of the vehicle on assessment last year offside in Buxton nearside near Chelmorton. The vehicle originally one of nine operated by London United as their SO 7 on contracted TfL routes in west London. 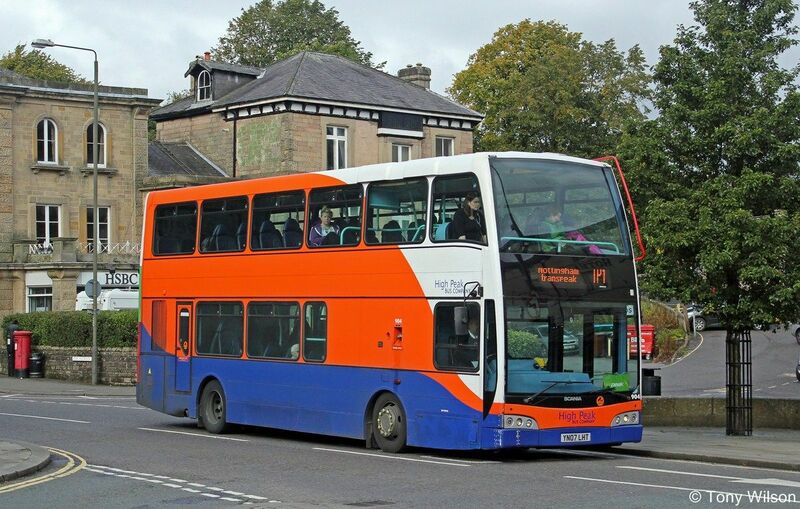 Finally, here's a picture below, when it was Transdev London United's SO 3. Captured here at Marble Arch in August 2007, when it operated out of Shepherd's Bush Garage on the long cross central London 148 route between Camberwell Green and Shepherd's Bush. Back then though it was operated as a dual-door vehicle, now since converted to single-door configuration.